The Patrol Bureau provides twenty-four hour a day uniformed police protection for the City. This Bureau is organized into three Patrol Shifts – Watch I — midnights, Watch II — days, and Watch III — swings. The Patrol schedule presently consists of four consecutive ten-hour workdays, followed by three days off. Each of the three shifts includes a supervisory team of a Lieutenant, and two Sergeants. There are a number of police and patrol officers that fill out the shift compliment of personnel. The City is divided into six geographical beats and on most shifts and most days each beat is filled. Since February 1992, police officers assigned to a shift are assigned to ‘primary’ beats and serve that beat for their full work week for the whole six month shift assignment. (Officers in Patrol experience a ‘shift change’ twice a year – in February and in August.) The Department administration had felt that there would be the potential of more familiarity between the primary beat officer and the community served. The officers are encouraged to stop by and interact with students in schools on their beats; attend the D.A.R.E. graduations at schools on their beats; meet residents, attend homeowner’s associations meetings, and attend neighborhood watch meetings that they become aware of that occur on their assigned beats. The Police Officers assigned to Patrol may also provide a number of ancillary functions. Many officers serve in the capacity of Departmental Trainers in such areas as firearms, driver’s training, first aid and life support, and arrest and control techniques. There are a number of officers who are paid a premium to serve as Field Training Officers – providing intensive one-on-one instruction to new employees. Police or Patrol Officers may also serve as field evidence technicians. These employees receive specialized training on evidence collection and preservation, crime scene diagramming and charting, crime scene photography and videotaping. The field evidence technicians are paid a premium pay while they serve in this capacity. Officers with at least three years of experience may qualify to serve of our Special Weapons and Tactics Team – S.W.A.T. Team. Members of this team go through a rigorous testing procedure that includes both physical and psychological examinations. Once accepted into this program, they complete a series of training courses which are certified by the Commission on Peace Officers Standards and Training. A number of officers are also cross trained to serve in the capacity of a Tactical Team. This group of employees have specialized training in crowd control and have worked with neighboring law enforcement agencies in a number of situations. The Department also has a number of trained crisis negotiators. These specialized and specific skills are necessary in very limited situations. Because the use of these skills occurs infrequently, a negotiator routinely serves in a primary capacity in almost any position in the Department, and is “on call” to serve as a crisis negotiator. 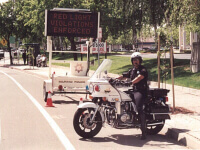 Traffic Safety is a unit within the Field Services Division and is currently managed by the Traffic Sergeant. The Traffic Sergeant manages and supervises 43 crossing guards and 4 sworn officers assigned to Traffic Safety. The Traffic Sergeant prioritizes traffic enforcement, assigning and scheduling officers accordingly. Additionally, the TrafficSergeant manages the field services vehicle fleet, and acts as liaison with the City Engineering Department to reduce accidents by coordinated planning, engineering, and enforcement. The Traffic Sergeant supervises the investigation of all traffic accidents, the vehicle abatement program, and the Police Department rotation tow companies. Four officers are assigned as motorcycle officers, responsible for enforcing traffic laws and the investigation of property, injury, and fatal traffic accidents, including hit-and-run accidents. These officers must take and pass advanced accident investigation courses up to and including Accident Reconstruction. Many of our motorcycle officers have ancillary duties including firearms instruction, defensive tactics instruction, and S.W.A.T. Motorcycle officers work both day and night shifts. Traffic Safety conducts a number of DUI/Driver’s License checkpoints each year. The purpose of these checkpoints is to deter driving under the influence, and to educate the public on the deleterious effects of drinking and driving, as well as unlicensed driving. Many of our checkpoints are coordinated with the annual Avoid the 13 campaigns against drunken driving during the holiday season.